Today I have a quick hot pink mani for you guys. Sometimes I get really sick of my manis so I have to change my polish daily. Normally I do it 2nd daily xp I usually only have time for a plain mani if I'm changing my polish everyday but I can't have a mani without nail art so I have to compromise and just add a glitter accent or a nail decal lol. This mani was a 15minute job that I'm not very happy with but I got quite a few compliments on it. Weird! 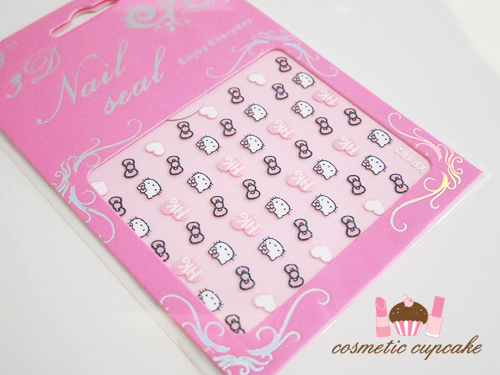 I stuck the Hello Kitty nail sticker upside down. FAIL. I used two coats of OPI Kiss Me On My Tulips* from the Holland collection on all fingers. In real life the colour is slightly darker than my photos. By the way I'll have my swatches and review of the Holland collection up very soon for you all! I used 1 coat of Essie Luxeffects A Cut Above on my ring finger and 1 coat of Shine of the Times on my middle finger. I don't have the skills or necessary patience for some of those complicated manis that you see on blogs, so manis with a simple twist are my fave. it is incredibly pretty!! i love it!! I love the nail art in your pinky finger! sooo cute! Thank you for the code!! I love Hello Kitty and these stickers look a great quality!